Jim Morrison, a Canadian, has been director of the Jeep brand since 2009. DETROIT -- Fiat Chrysler has named a top lieutenant of the Jeep brand to head the day-to-day operations of Ram, while the current head of Ram has been moved into a new job aimed at boosting Ram’s international presence. Jim Morrison, 48, the longtime director of the Jeep brand under Mike Manley, has been named head of the Ram pickup and commercial-vehicle brand, though still reporting to Manley. Morrison replaces Bob Hegbloom, 52, who was named to a newly created position of head of Ram International. In that job, Hegbloom is responsible for expanding Ram’s presence outside of North America, an FCA spokesman said. Morrison is being replaced as director of the Jeep brand by Scott Tallon, 40. In October, FCA changed its organizational structure to put Ram under Manley’s control and consolidated its car brands -- Chrysler, Dodge and Fiat -- under Tim Kuniskis. Morrison, a Canadian, has been director of the Jeep brand since 2009. 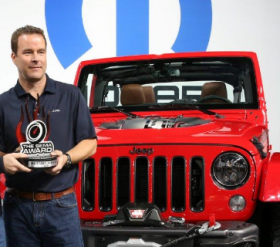 As the brand’s second-in-command, he’s helped oversee Jeep’s phenomenal growth in recent years.